The richest billionaires rule the chaotic world – Politicians, Nations’ Government, the People and the ‘System’. The fact everyone knows, yet fear to say it in every day’s life. ‘Power’ and ‘Greed’ of a few, very few, have pushed our universe towards a point of no return. These powerful individuals have achieved great success in various perspectives without really caring for the people and the universe at large. Greta Thunberg has taken the centre-stage at the World Economic Forum in Davos from all the big countries and business tycoons. The world is watching her fearlessness to save the world. They are awestruck by her guts and gumption to think about the future of our decaying dying planet. She has become an epitome to inspire schoolchildren around the world. 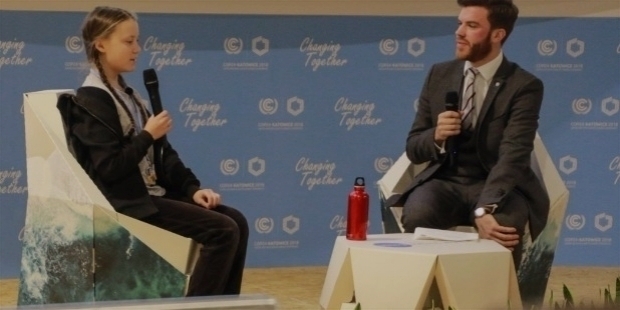 Greta Thunberg addressed the COP24 United Nations Climate Change Summit on the 4th of December 2018. On the 12th of December 2018, once again she addressed the COP24 Plenary Assembly and the whole world witnessed her saying, “You only speak of a green eternal economic growth, because you are too scared of being unpopular. All of 15, she shook the world with her no-nonsense intelligence to put the world leaders hiding their powerful faces into shame. In spite of her health conditions, she is way matured than all the world leaders put together. Greta suffers from autism. In spite of her diminutive stature, Greta Thunberg is standing the tallest among all the world leaders put together. 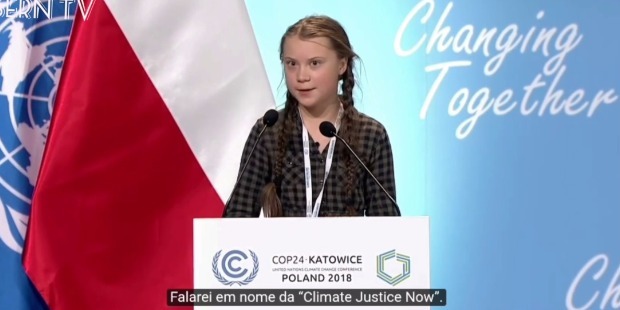 In her speech, Greta Thunberg said, “If you start to see your kids walking out of school now and then, you might blame Greta Thunberg. The adults of this world are useless and care more about their own prosperity than they do of their own children.” She speaks precisely and to the point, unlike the politicians, who go on talk about everything except the real issues. 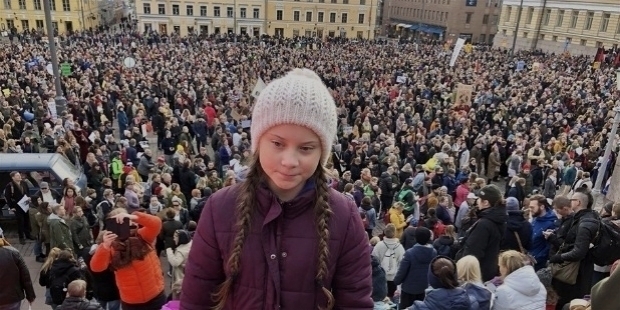 The Swedish teenage sensation Greta Thunberg has galvanized protests by High-School students in Europe, Japan and the United States demanding stronger government action to fight global warming. Her poise and intelligence are exemplary for the world’s richest people to learn about why this teenager has stood the ground and speaking about Climate justice. Greta Thunberg was born on the 3rd of January 2003 in Sweden. Father Svante Thunberg is a Swedish actor, producer and author. Mother Malena Ernman is Swedish Opera Singer. She is the granddaughter of renowned Swedish actor-director Olof Thunberg. Greta has been diagnosed with autism. On her insistence, her family became vegan and gave up flying. In July 2018, Sweden experienced unprecedented heat waves and drought killing hundreds due to extreme weather conditions. It was perhaps the tipping point in Greta’s life. As a ninth-grader student, Greta decided on the 20th of August 2018 to not attend school till the 2018 Sweden General Election on the 9th September. 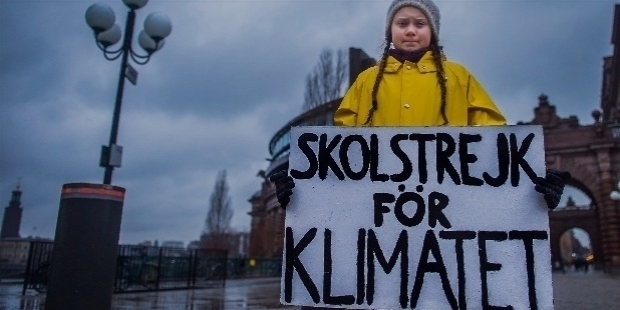 She sat outside the Riksdag every day during school hours with the sign ‘Skolstrejk för klimatet’ – School Strike for the Climate. This was the beginning of Greta’s exemplary bravery to shake the world leaders, starting from her own country. She demanded the Swedish Government to reduce carbon emissions as per the Paris Agreement. Her protest was noticed by one and all. She continued her strike after the General Election. 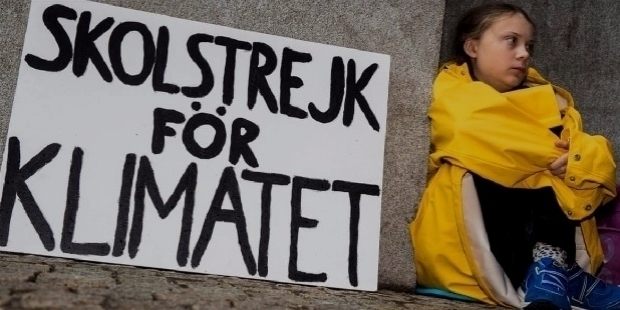 Each Friday, she sat with her sign ‘Skolstrejk för klimatet’. 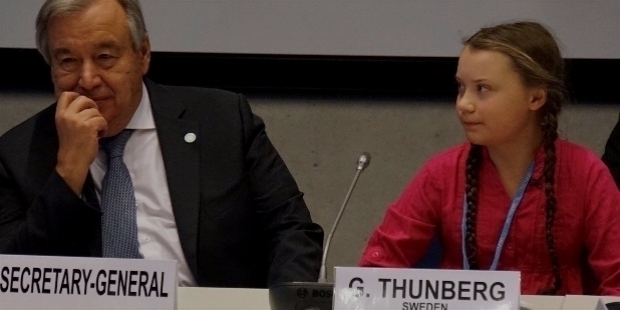 Greta Thunberg’s determination and courage gained world’s attention. School students across the world became aware of Greta’s solo initiative to save the world. Inspired, students joined her ‘only on Fridays’ Strike’. By December 2018, 270 cities saw the rise of ‘Students’ Strike for the Climate’ in countries like Sweden, Australia, Austria, Belgium, Canada, the Netherlands, Germany, Finland, Denmark, Japan, Switzerland, UK and USA. An amazing 20,000 joined the strikes around the world. Australian students ignored their Prime Minister Scott Morrison’s ‘more learning in schools and less activism’ statement to join the strikes. 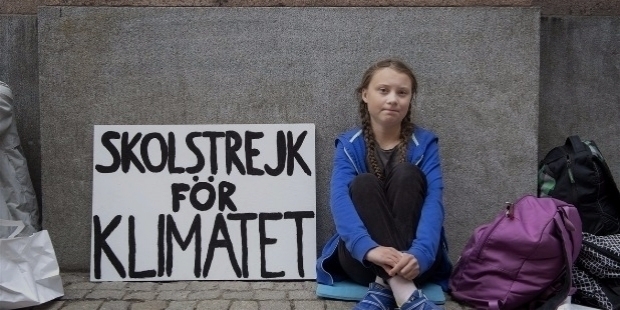 Greta Thunberg had lit the tiny spark in every student’s heart to save the planet for climate justice. She participated in the ‘Rise for Climate’ demonstration outside the European Parliament in Brussels. Greta also went to participate in the ‘Declaration of Rebellion’, which was organized by Extinction Rebellion in London. 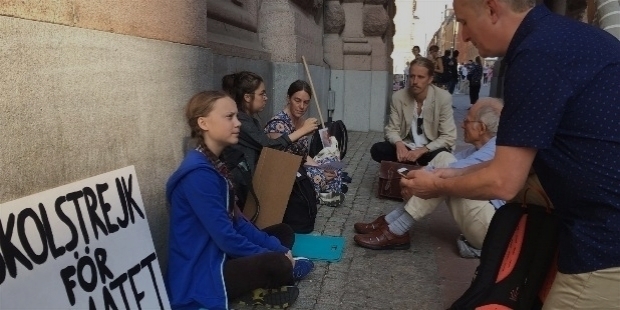 Greta Thunberg is a bright student with her heart in the right place. In May 2018, she won the Svenska Dagbladet's debate article writing competition on the climate for young people. She is one of the three, who has been nominated for the ‘Young Environmental Hero of the Year 2018’ in the World Nature Fund’s Prize. Greta was also nominated for the Telge Energi’s Prize for Children and Young People. However, she declined to attend the event in Stockholm, because she is against flying by air. In November 2018, Greta was awarded with the Fryshuset Scholarship of the ‘Young Role Model of the Year’. 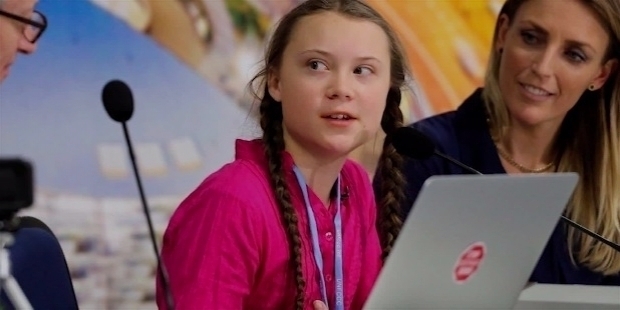 In spite of her tender age, her strong character to think about the planet has made Greta Thunberg a force to reckon with. She has become a sensation in the world and TIME magazine named her in the ‘World’s 25 Most Influential Teenagers of 2018’. Greta Thunberg’s success at such a young age has inspired millions of school students around the world. Great Thunberg is simply awesome!